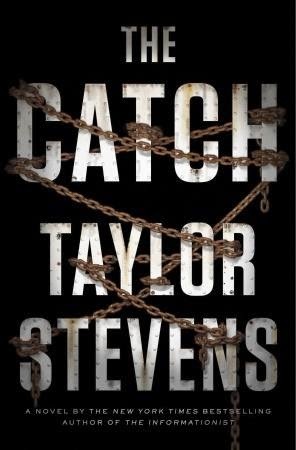 The Catch is Taylor Stevens' fourth entry in her Vanessa Michael Munroe series. Vanessa Michael Munroe is....well, she's deadly, with incredible physical skills and she's brilliant - she speaks many languages and easily assimilates into the situation or culture she finds herself in. She can read people and situations and think three moves ahead. For a living, she hunts people, finds information and fixes things. After her last case resulted in a horrific personal loss, Michael has retreated to the continent that seems to draw her back time and time again - Africa. She's laying low, having taken a job with a small company that provides security for ships travelling the waters that Somalian pirates troll, providing information and greasing palms. When the owner pressures her to join the latest security job as a guard, she finds herself in the middle of a mess. The owner is lying, the hold is full of Russian guns, but it seems to be the captain that the pirates are after. And Michael's quiet retreat is no more. Stevens has again crafted another intricately plotted thriller. Munroe is on her own this time, with no back-up. The action slowly builds through the first few chapters and then hits high gear for the rest of the book. The details of the settings and culture are vivid and detailed. But, it is the character of Michael that is the real draw of this series. It's so much fun to have such a kick*** female character. The action scenes are great, but there's a deeper level to this character as well. She is the walking wounded and Stevens does a fantastic job depicting Munroe's inner emotional turmoil and her physical struggle to control herself. Each book out, we learn a little bit more about Munroe and her background. Having read of Stevens' background, I wonder how much of her own life has been woven into her books. The Catch has a satisfying ending, but the door is open for the next entry is this series....one I'll pick up for sure. Read an excerpt of The Catch. You can keep up with Taylor Stevens on Facebook and on Twitter. Making Math Fun With DK Canada!